A will is a formal document that allows you to decide how your estate should be managed and distributed after your death. Every state has various requirements to ensure a will is valid and executed in the manner intended by its creator. Failure to follow state laws can cause beneficiaries to lose inherited property or may cause a legal will to be completely invalidated. You can take certain precautions to ensure your will is valid. Verify that you have met your state's legal will age requirement. Most states have a legal age requirement of 18 years, but other states have a lower age requirement. Georgia, for example, requires testators to be at least 14 years of age. Hire an attorney. Attorneys are not required by law, but they can help ensure that your will has all the necessary provisions and is executed according to state law. They can also help relieve stress during the creation process. 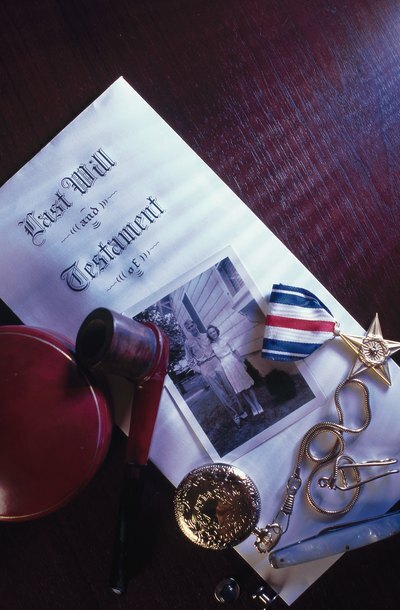 According to the American Bar Association, 85 percent of Americans hire attorneys to help prepare legal wills. Typewrite your legal will. Many states already have this requirement because it helps prevent confusion, forgery or unwitnessed amendments. Oral and handwritten wills are accepted only under limited circumstances. Videotape yourself reading and signing the will to help prove that you are of sound mental capacity. Every state requires that testators be of sound mind, capable of reasoning and understanding the implications of a legal will. Although the person does not need to be declared mentally incompetent by a court, courts may allow evidence and testimony from disgruntled relatives to prove that the testator's judgment was impaired through conditions such as undue pressure or debilitating sickness. A videotape may help discredit such presumptions. The tape, however, may not replace an actual written will. Include a substantive provision in your will indicating your intent in making the document your final word on what becomes of your property and that you understand the severity and implications of the decision. The provision helps further the mental capacity condition and establishes your intent in clearing any ambiguities caused by external factors such as unofficial or implied promises. Gather the necessary witnesses to sign and witness the legal will. Every state requires a different number of witnesses. California, for example, requires at least two witnesses; New Hampshire requires three witnesses. Try to include one more witness than the minimum requirement. The more witnesses you have, the more validity you can add to your will. Some states prohibit using a will beneficiary as a witness, also known as an interested witness. Interested witnesses may cause others to contest the will believing that the testator was unduly pressured or coerced and therefore not of sound mind when he created the will. Avoid this scenario by using only disinterested witnesses. Arrange to have a notary present during the signing of the legal will. Having a notary can help provide a disinterested witness as well as credibility in the eyes of the judge. Notaries are public officers sworn to their duties, so their inclusion can add validity to the document. Sign and date the self-proving affidavit. The self-proving affidavit is a section in the will that helps guarantee the testator is signing the document before witnesses, who will in turn also sign the document. In some states, the self-proving affidavit might eliminate the necessity for witnesses to testify to the will's validity if the will is contested. Affidavits are useful when a witness has died or is unavailable and the court needs someone to verify the legitimacy of the will. Testamentary capacity is perhaps one of the most-cited reasons for challenging the validity of a will during probate, and for good cause. Capacity directly affects a testator’s legal ability to make a will, which is why every state defines strict statutory guidelines describing mental competency. Most states do permit claimants to contest a will on grounds of diminished or lacking testamentary capacity if the testator was under the influence of mind-altering medication. However, medication affects each individual differently, so the courts must examine the testator’s state of mind and the actual effects of the medication on a case-by-case basis.